By TLex [CLOSED] If you haven't already entered this month's GIVEAWAY to win the fantastic Artego 500M Diver; here's you last chance! Sweet Looking Diver!! !I want One!! Built to withstand great pressure, I'd definitely love to have one, that's for sure. it´s a really stylish everyday "sports" watch. Big, heavy, classy. Great watch. Great look and design. Would love to see on my wrist. 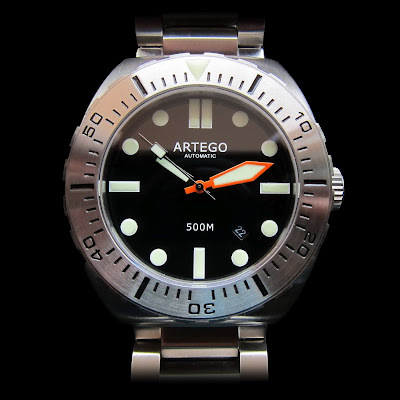 Have been meaning to buy the Artego. MAybe I won't have to -- thanks!! Very nice! Would love to own it! That watch looks great, love the case design and minimalist dial! What a beauty. Hope I win! The orange plongeur hand compliments the watch nicely. I like the size proportions as well. Very cool looking watch. I like it. Best model yet! Love the new indices! Yeah, the new dial is a huge improvement. A solid diver with a reliable movement in a clean, bold and simple design. Just the way I like a good dive watch. I'm becoming a big fan of their watches. Nice big hefty design. Please give it to me because I'm tired of the hunt. Make it easy for me. I like the markers a lot. Very sharp. love the very clean face on that watch. What a great looking diver! I've been a big fan of Artego. Love the contrast of the glossy black dial and the orange minute hand. Classic look done very well.